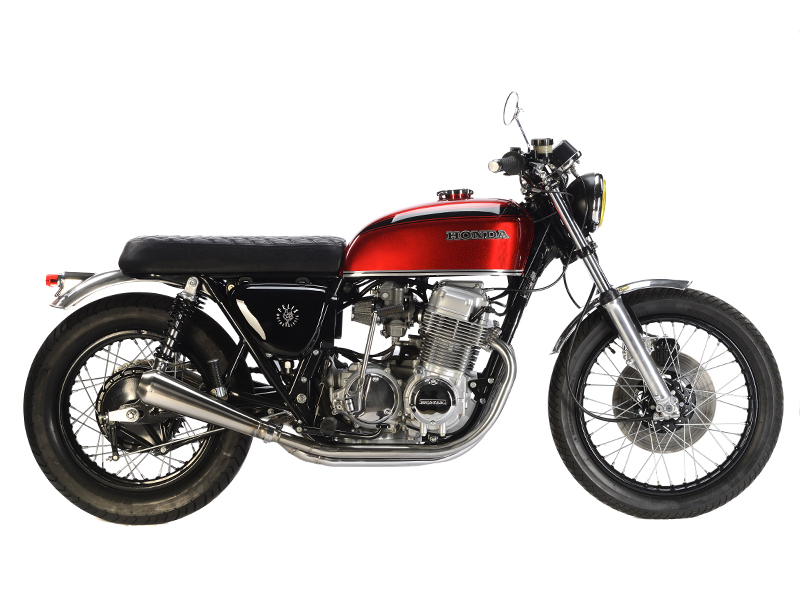 I had the opportunity to buy this CB 750 that came from Corsica. A 1977 K7 model with its large tank that is far from being the most beautiful in the lineage, but such a legendary mechanical base is not to be denied! 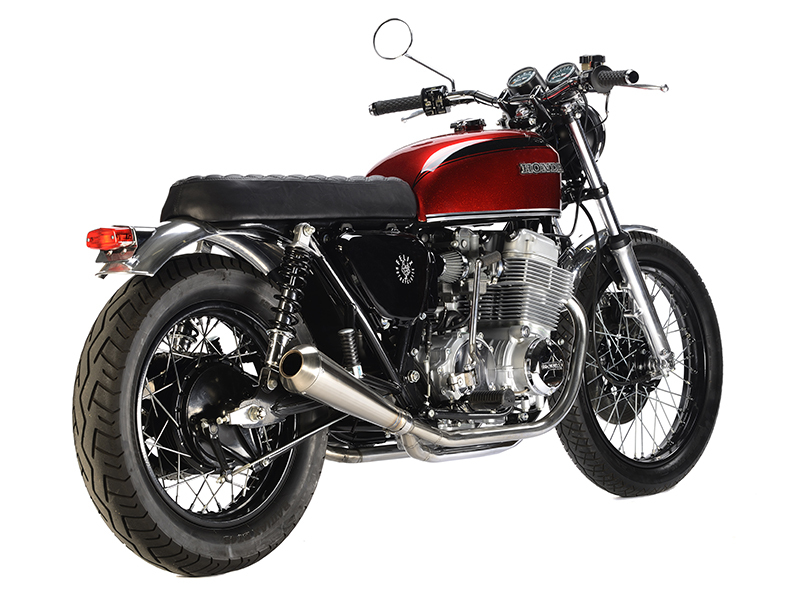 As we had already carried out a complete restoration of a 1972 CB 500 KO, the idea was to give it a new life. Some time later, I found a little by chance a tank of K2 completely redone and painted with a metallic ruby red. The painting was really beautiful! 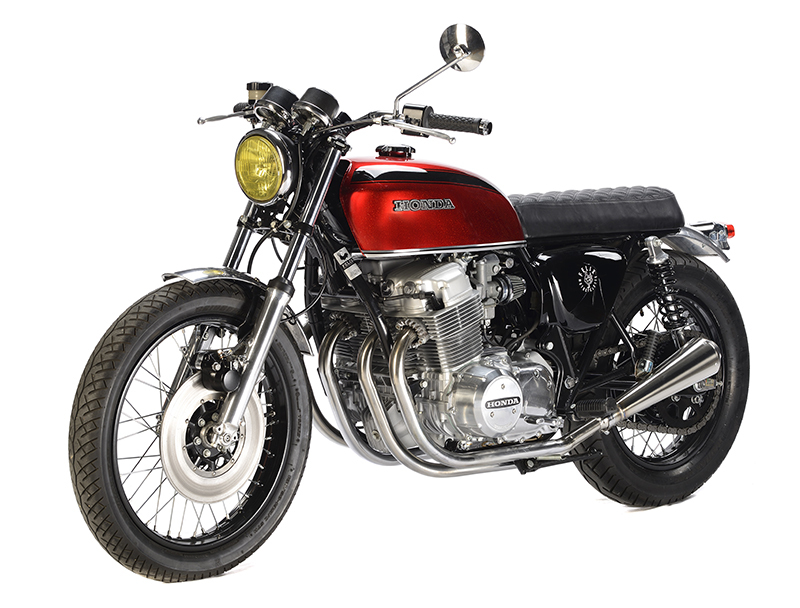 It is therefore from this element that the restyling of this CB 750 came to me... The bike was thought around this beautiful part. 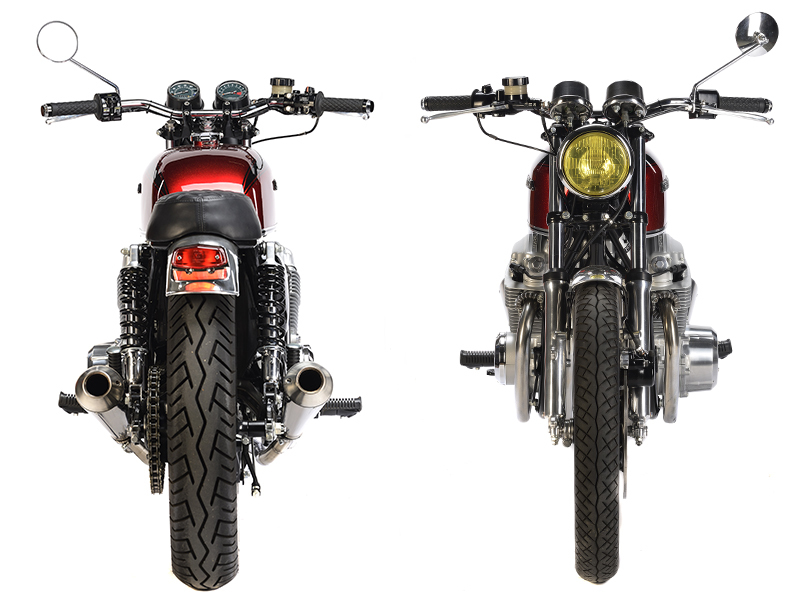 I wanted to create a kind of ‘Café Racer’, very bare, very simple, even minimalist so that the eye could concentrate on the tank/motor assembly so characteristic of this legendary machine. I knew Patrick was going to have his work cut out for him because the basic machine was ‘in its own juice’. The whole was in good condition for a machine that has 60,000 km, but the famous 4-cylinders hadn't been running for many years. As is very often the case, a complete disassembly was necessary. The pistons, rings, distribution, seals have been changed. The carburettor ramp was ultrasonically treated, sanded and refurbished. Patrick then worked on the frame to adapt the K2 tank to this K7 frame. The rear part of the frame has been modified to accommodate a shorter and narrower seat. This required the creation of a homemade saddle bottom and new supports. Once these modifications were made, the frame, accompanied by the rims and side covers, headed for the PROMETHE cabins to receive a glossy black powder-coated paint. As for the saddle covering, it is of course our appointed saddler Vincent Bouffort who has taken care of making it on the basis of black leather embellished with diamond stitching of the most beautiful effect. My desire to make it a lighter machine still required some adaptations on the block and the part cycle. 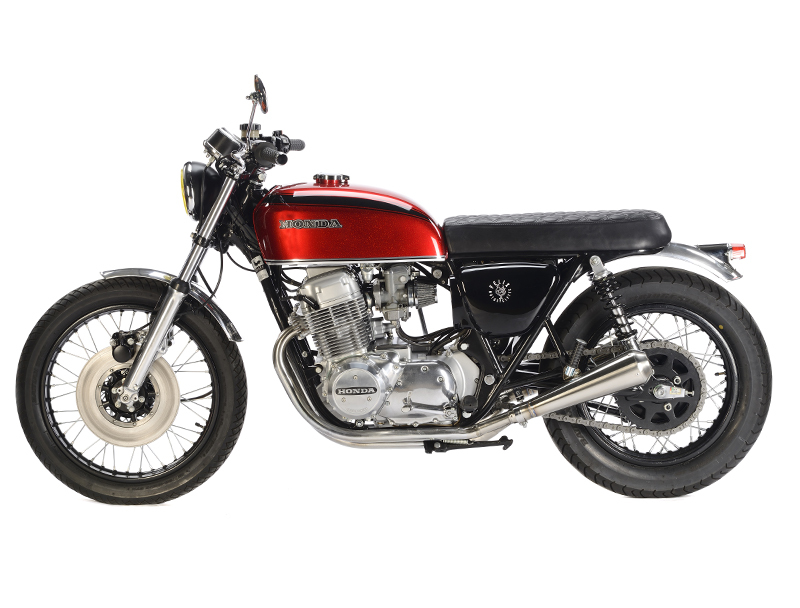 The air filter box has been removed and replaced by cones, the electrical wiring harness completely redone and simplified, the original collectors extended by two silencers, the fork lowered. Analog gauges have been replaced by identical but smaller CB 125 elements that keep the same typical green background. 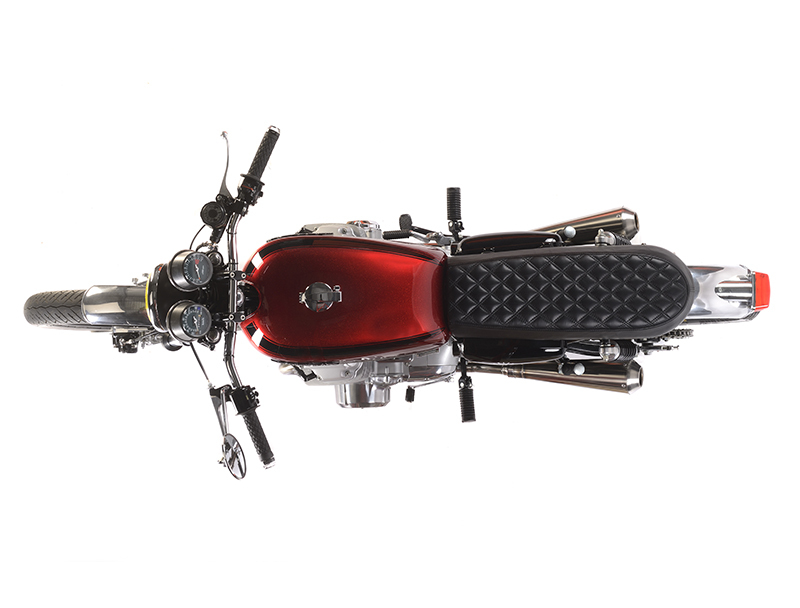 The headlight, which is also smaller, is the one of a Suzuki Van Van and a small, fairly flat handlebar with Motogadget turn signals at the ends has been fitted.